Macadamia nuts come from the fruit of a large evergreen tree native to eastern Australia. Thousands of years before European settlement, the aborigines of Australia gathered the native nuts from rainforest floors and consumed them as snacks. Other major producing countries are South Africa and USA (Hawaii). In general nuts contain many good fats and unsaturated fats.. The macadamia contains many of these unsaturated fats and some studies show that this type of nut helps to reduce blood cholesterol. The nuts are rich source of mono-unsaturated fatty. Also rich in many important B-complex vitamins that are vital for metabolic functions. 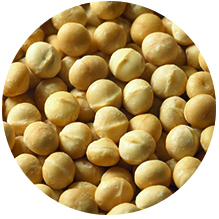 Macadamia nuts are usually eaten on their own by roasting them slightly. Roasted and crushed nuts are sprinkled over desserts, sweets, salads and cereals. They are also used in the preparation of muffins, cakes and biscuits. Use it as butter, oil or simply munch on a handful-macadamia nuts will fill with their flavor and give the body the nutrients it requires.